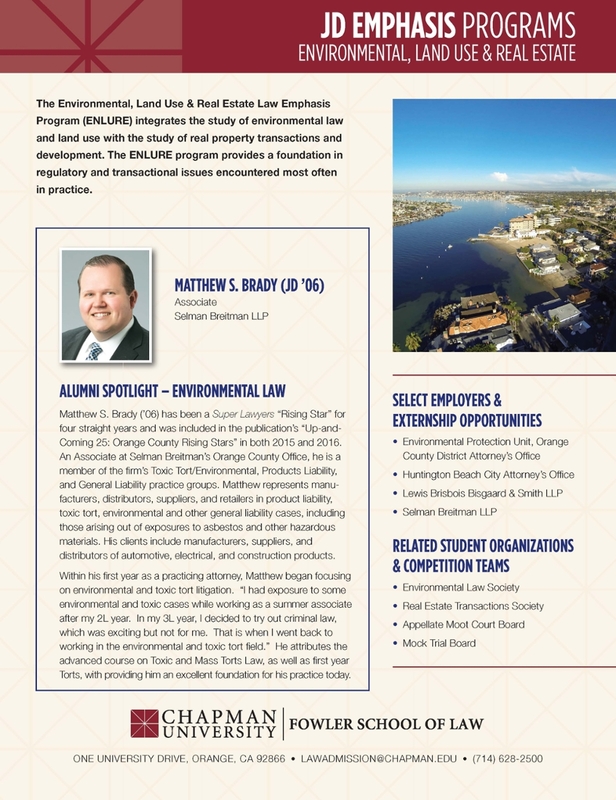 Differing from traditional environmental and real estate law programs, Chapman University Fowler/ School of Law's Emphasis Program in Environmental, Land Use, and Real Estate Law (ENLURE Program) integrates the study of environmental protection and land use regulation with the study of real property transactions and development, leading to a certificate and transcript notation. Professor Kenneth Stahl Directs the Program. Students write research papers that may be published, and ultimately pursue career opportunities that take them to the cutting edge of environmental, land use, and real estate law. 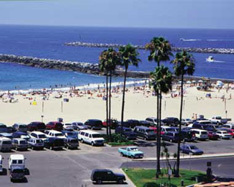 All of this occurs in the ecologically stunning and economically vibrant environment of Southern California, a perfect laboratory in which to study land resources issues. Property law is studied as a social and legal institution to facilitate the acquisition, retention, disposition, and use of personal and real property. Students explore a variety of rights and responsibilities in property, including distinctions between real and personal property, the nature of ownership and possession, adverse possession, landlord-tenant law, present and future estates in land, concurrent ownership, conveyancing and deeds, recording, common law land use controls (e.g., nuisance and trespass), private land-use restrictions (e.g., easements, covenants, and equitable servitudes), public land-use regulations, and eminent domain. The course may include introductory exposure to trusts, donative transfers, intellectual property, fixtures, mortgages and financing land transactions, and ownership of natural resources (e.g., water, oil, gas, other minerals, wildlife). These courses cover the powers of the federal government and selected topics regarding the relationship of the branches of the federal government to each other and to the States, as well as selected topics regarding the Bill of Rights, due process, equal protection, and the effect of the Fourteenth Amendment on the application of the Bill of Rights to the States. This course constitutes an analysis of the ends and means of environmental protection through study of statutes, administrative regulations and practices, and judicial decisions treating the protection of the environment in the United States. Topics may include statutes that regulate pollution emissions (e.g., Clean Air Act, Clean Water Act); procedural requirements (e.g., National Environmental Policy Act, California Environmental Quality Act); administrative law (e.g., standing, standards of judicial review); hazardous and toxic substances and wastes; risk assessment and management; natural resources and wildlife conservation; enforcement and liability; and environmental justice. This is a core requirement in the Certificate in Environmental Law, Land Use, and Real Estate Law. The grade in this course is based on a paper. This course examines the government regulation of land use and development. It is a course in applied constitutional, administrative, and property law. The material covers land use planning, zoning, advanced and flexible zoning mechanisms, subdivision controls, constitutional and state law constraints on regulation, the economics and politics of land development, growth controls, the environmental regulation of land use and ecosystems, and alternatives to regulation. Students are exposed to business decision making, public problem solving, regulatory permitting, and social science analyses. Specific offerings may vary from year to year, depending on periodic rotation of electives, instructor availability, student interest, and scheduling dynamics. For more information, view our course descriptions. Find out more information about Chapman's externship program. Graduates will know the basic principles of the substantive law applicable to environmental, real estate, and land use law. Graduates will be able to engage in legal analysis and reasoning as required for the competent practice of the law. Graduates will demonstrate the ability to write effectively as needed for the competent practice of law. In the ENLURE Program, students learn from distinguished scholars and mentors, including a former Assistant US attorney, a United Nations Global Compact Consultant, Property Rights experts, and attorneys with extensive legal experience. A variety of other faculty and administrators are involved in projects, research, and classes that relate to the ENLURE Program. Distinguished practitioners bring their expertise to the classroom as adjunct professors and speakers in ENLURE courses.